April 7, 1997. A mark in Malawi’s history was hewn. What was destined to become Malawi’s unique style of writing, the Mwangwego Script was launched. 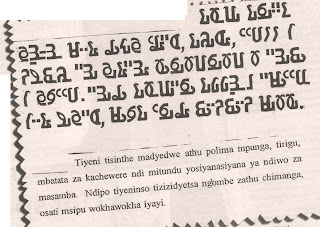 The script, which was to be used for writing Malawian languages, was to be incorporated into the school syllabi. Its inventor, Nolence Mwangwego said he had come up with the script since although Malawi had many languages, the country still used the Roman alphabet to write languages like Chichewa, Lomwe, Tumbuka, Ngoni, Sena, Yao and others. 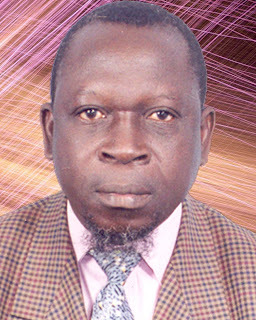 A unique Malawian style of writing, in his view, was necessary for the nation’s identity. A decade down the line, little, if anything, has been done about the script and the least to be surprised by the turn of events is Mwangwego himself. “I am not surprised at all because Malawians are not willing to acknowledge the script. Any invention coming from fellow Malawians will face resistance. We are only willing to learn things that are given to us by the West,” Mwangwego said. For him, a teacher of French, the past ten years have been a struggle, using personal finances to promote the system of writing by teaching a number of pioneers and holding lectures on the script at various institutions, including the French Cultural Centre, Chichiri, Blantyre and St Mary’s secondary schools, Thomas College of Education and at the Chancellor College. “My target is to teach 10,000 people. I have only managed to teach 132 people due to limited financial resources. I have not been able to publicise the script as much as I would have loved,” he said. The pioneers of the syllabic system of writing have formed a Mwangwego Script Club. John Bosco Gondwe, a management lecturer at the Staff Development Institute, who is a member of the club, said he learnt the script out of interest. “I have been interested since the launch, which I attended. It took me less than six months to master the writing style. Considering the inventor’s efforts, I am sure something bigger must be done,” he said. But maybe the script is not gaining recognition because Mwangwego has chosen to fight alone, for his script. Maybe the script can never attain national identification because it is more of a personal thing because it bears his name. And, against all odds, maybe the script is just too difficult to learn. “I have tried all avenues. I have written to several MPs. I have tried the civil society, and the private sector. Nothing has been forthcoming,” Mwangwego said. He brushed aside the insinuation that the script is his personal identity because it bears his name. “Braille, the system of writing used by visually-impaired people was developed by Louis Braille; the Cyrillic alphabet was developed by two brothers, one was Cyril. Malawians ought to be proud that one of them invented a system of writing,” said Mwangwego, who is featured in one of the editions of the Contemporary Who is Who of Professionals, published by the American Institute of Biographers. The Mwangwego Script has three sets of symbols: 32 misisi, which are the main symbols; 11 mituyo, which are the auxiliary symbols and misiri, the secondary symbols. “These symbols are designed to write all Malawian languages, from Chichewa to Ngoni through Tumbuka and Lomwe. I am now working on developing computer software so that I catch up with the information age,” says Mwangwego. He is currently writing a Chichewa book titled Kupusitsidwa (Being Fooled), where he uses the Mwangwego Script as the style of writing. And on the drawing board, he dreams of setting up a Mwangwego Academy, where the script would be taught and a Mwangwego Museum, where information about the script would be stored. Let’s diversify our diet by growing rice, wheat, Irish potatoes and different types of vegetables. Let us feed our cattle with grains as well, not just fodder. Yes, i think that website is now www.kuseka.com. just a cool one for Malawian fun. It is very unfortunate that Malawians until this day do not want to accept this script. one of the major reasons is that it was invented by a Malawian. If it had come from the west, it would hav been fully adopted by now. mwangwego has met so much resistance in the ten years of the script. We need to appreciate his efforts as it took him a very long tym to finish. We need to wake up and come to our senses before its 2 late. I guess u want him to die b4 u can recognise him. No1 must eva claim to hav assisted him in promoting the script because no1 did.